For Indiana University junior Mica Caine, studying abroad was a different experience than anything she could have expected. 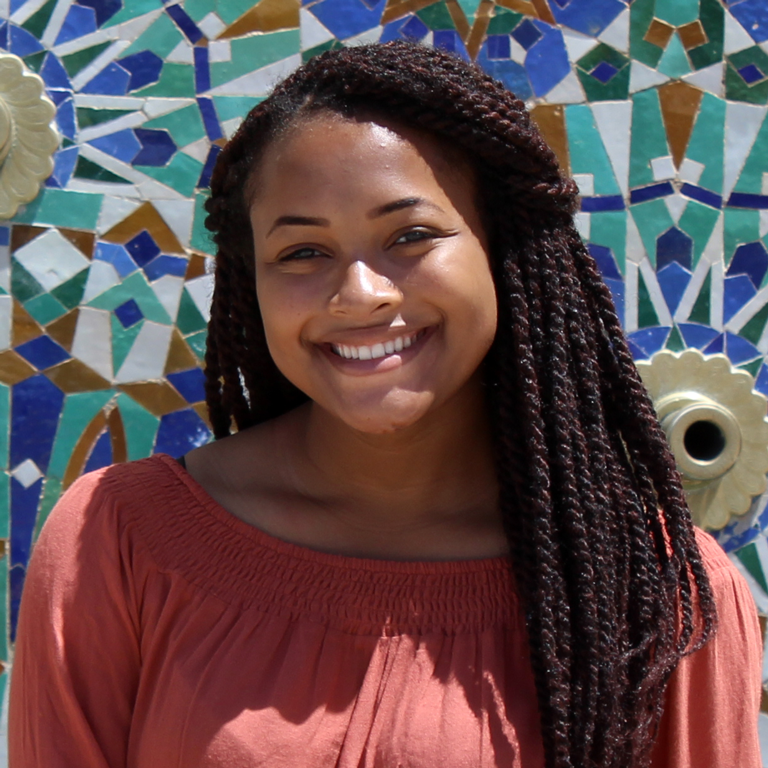 Caine, who is a Hudson & Holland Scholar—a program within IU’s Office of the Vice President for Diversity, Equity, and Multicultural Affairs (OVPDEMA)—was already a fluent French speaker, so that part of her journey to Rabat, Morocco, last summer wasn’t anything she couldn’t handle. But the cultural norms the Columbus, Ohio, native contended with opened her eyes to society’s differences in another part of the world. “Morocco was incredible, but with Morocco being a Muslim country, I did experience a little bit of culture shock. It wasn’t much as I thought, but it’s definitely more of a modest country, so I did struggle a little bit with being true to myself, as well as being culturally compatible with my host family,” recounted Caine, an information systems and business analytics major at the Kelley School of Business and a French Arabic minor. Caine had a preference of being with a family that had a daughter in the same age range, but instead was placed with a family consisting of five brothers, likely because the mother requested a female exchange student. Even with that unexpected development, Caine had a great time in Morocco. “Every weekend, we traveled to different places around Morocco. Although I was studying in Rabat, I traveled abroad to Tangiers, Chefchaouen, Fes, Essaouira, and other cities,” said Caine, who was able to finish her minor in French while in Morocco. Do it, don’t be scared, and to a degree, definitely don’t listen to other people who haven’t been abroad. That can be the biggest hindrance, listening to all the concerns of your family and friends. The opportunity to study abroad was made possible by a scholarship Caine received through OVPDEMA. Caine, who hopes to work in corporate IT eventually, learned of the scholarship through Ochmaa Escue, the director of OVPDEMA’s Overseas Studies and Scholarship Program. While in Morocco, Caine was part of a Francophone program, which required her to take her classes in French, in addition to course taught in Darija, the Moroccan dialect of Arabic. While it was challenging, the active Caine, who is also the president of the Undergraduate Business Diversity Council, an organization that provides resources, social activities and professional development opportunities for underrepresented minorities for the business school, the historian-in-chair of arts and letters for the Gamma Nu chapter of her sorority, Delta Sigma Theta, Inc., and a member of the board of Aeons, 12-person board that advises the president, it’s quite evident that she can handle multiple duties at the same time. That’s why she’s already signed up for another experience studying abroad in the spring semester, this time in Rouen, France. “After my experience in Morocco, I like the fact that I’ll be able to have a Francophone experience while still having a lot of freedom and the ability to travel to other countries,” explained Caine, who began school in a French-immersion program, then took private lessons in the language after moving to a new school district. Caine, who had previously traveled to several countries in Europe while in high school through a program called People to People, is very encouraging of her fellow IU students who are considering studying abroad through an OVPDEMA scholarship. “The OVPDEMA scholarship is a really good way to supplement additional funds to help you with your flight and meals. You can apply to small $500 scholarships, but since OVPDEMA scholarships range up to $4,000, you can get everything you need if you have your program paid for. It’s a great way to supplement other aid that you have,” said Caine, who will be returning to General Electric for a summer internship in the company’s aviation division, the second summer she’s worked with G.E.